November | 2015 | NFL News, as it happens, when it happens. Your one stop shop. With a score of 24-30, the 2015 New England Patriots’ chance at a perfect season came to a screeching halt in Denver. There were many reasons for this crushing and untimely loss. The officiating was absolutely dreadful on both sides of the ball but seemed to really needle the Patriots with a bunch of phantom calls during crucial moments in the 4th quarter. Most notably, Rob Gronkowski was called for an outrageous offensive pass interference penalty, costing the Patriots a first down and a chance to keep an important drive alive. The play clock fiasco during the Bronco’s injury timeout during the final drive was as confusing as it was accurate. Communication between the officials to the coaches and the players was downright pitiful. The defending Super Bowl Champions entered the game with several notable star players missing, specifically offensive weapons Julian Edelman, Dion Lewis and Danny Amendola. Whereas both teams lost crucial players during the game, the losses of Dont’a Hightower and Rob Gronkowski seemed to derail the Patriots considerably. Losing Hightower opened up the run game for Denver, which on a night of snowy conditions was a godsend for their young Quarterback Brock Osweiler. Gronkowski going out with a scary knee injury not only sucked the wind out of the Patriot’s collective sails but removed the final clutch superstar Tom Brady had left to throw to. Finally and most importantly, Brock Osweiler played well in the 4th quarter, as did the entire Denver Broncos team. Although it is unpopular to say, the truth is given the cast and the set of circumstances The Denver Broncos made the most of their favorable circumstances. The tide turned drastically when Patriots’ rookie wide receiver Chris Harper fumbled the punt return and placed Denver in a scoring position. Did the Broncos take advantage of some slanted penalties and questionable play calls by the Patriots? Absolutely, and had the shoe been on the other foot Tom Brady and company would have done the same. This game was a gut punch to Patriot Nation, leaving many fans irate that a winnable game and a perfect season had slipped away. Where it is true, the perfect season is no longer on the docket for the Patriots, this game is far more than just a sickening loss. In fact, this game told us more about the 2015 Patriots squad than the entire set of undefeated games played prior to it. With Darrelle Revis and Brandon Browner gone in free agency, NOBODY gave this Patriots defense, more importantly the secondary, much of a shot at even being average. Malcolm Butler, Devin McCourty and especially Logan Ryan did a great job for the most part buttoning up Denver’s receivers Sunday night. 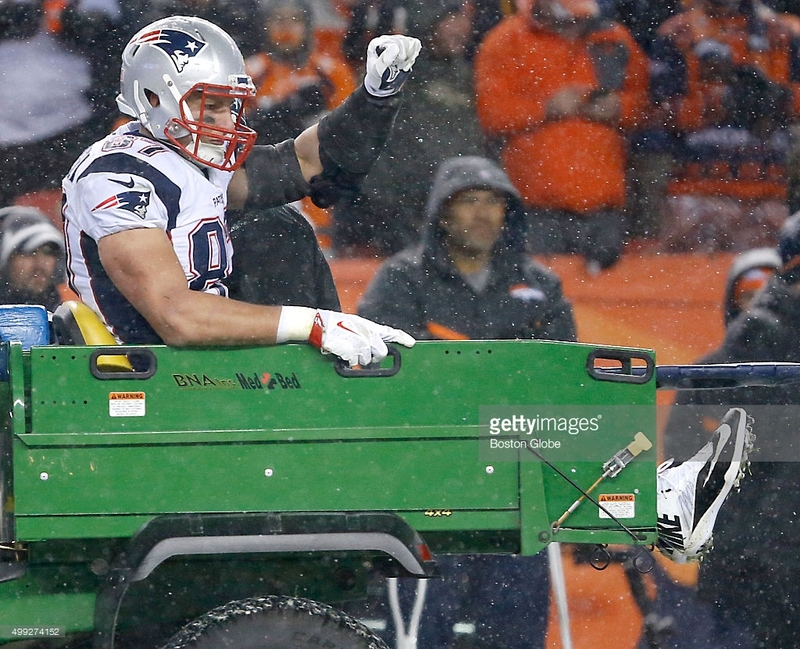 Sure, Butler missed a few costly plays against Sanders but Logan Ryan all but eliminated Demaryius Thomas. Knowing that Logan Ryan is someone that can be counted on to remove a superstar receiver like Thomas from a game cannot be understated. This defense is formidable and an incredible asset, warts and all. The Patriots offense has seen better days this year with the losses of Edelman, Amendola and Dion leaving unproven talents such as Chris Harper, Keshawn Martin and complimentary pieces like Scott Chandler and Brandon Lafell as primary targets. Still, even with this rag tag grouping (with the help of star Tight End Rob Gronkowski), the Patriots still scored 24 points over the best defense in the league. In fact, until Harper’s untimely fumble, the Patriots held on to a two score lead for considerable length of time. Rob Gronkowski’s role on Sunday can’t be understated, yet he still only one man and this offense stepped up when most teams would have crumbled to pieces. The Offensive line, far from perfect was better than the Buffalo game and for the most part fairly sturdy as well. In the end, it took overtime to stop Sunday night’s bruised and beaten New England Patriots and that was impressive. Ultimately, Julian Edelman should be back for the playoffs, both Jamie Collins, Dont’a Hightower and Danny Amendola will be back sooner than later, Rob Gronkowski’s injury was not nearly as bad as it looked, and the Patriots (in their current incarnation) are a tough as nails team which should survive their schedule and persevere until most of the pieces are back in the puzzle box. The Denver loss on Sunday night will not define this Patriots’ season anymore than an undefeated streak was necessary for a Super Bowl Championship. RB James Conner – Pittsburgh. If he didn’t tear his MCL in the first game this season, Conner was a front runner for the Heisman. With that injury, teams are more apt to focus on the players that have a full year of game tape. At 6’2, 240 pounds, Conner is a load that can be the heir apparent to LaGarrette Blount. He isn’t fast, but he’s a plodder that can be had easily in the 2nd, but could be had in the 4th and later. Also, the Pats have had success with Pitt running backs in the past (Dion Lewis and Curtis Martin). G/T Denver Kirkland – Arkansas. Belichick likes amassing O Line depth and this year proves that you can never have too much depth at the position. Kirkland is massive (6’5, 340) that can play both guard and tackle and is nimble for a man his size. Versatility is a staple of all Patriots and Kirkland looks like he could be dominant at G at the next level. DE/OLB Jordan Jenkins – Georgia. Even with the drafting of Tre Flowers and Geno Grissom last year, Belichick is putting a premium on pass rushers. Jenkins isn’t an elite pass rusher coming out of Georgia (but neither was Hightower). But he was a captain, but Belichick loves collecting college captains and Jenkins is someone that, again, offers versatility. He can play OLB in a hybrid front but has the size (6’3, 255) to put his hand in the ground and rush the passer. Jenkins just looks like a Patriot. WR Leonte Carroo, Rutgers. You can’t have the draft process without the Pats looking at a Rutgers prospect. Although Carroo doesn’t have elite size (6’0, 205) and speed, he’s a precise route runner that can uses his athleticism and body control to be a threat both on the outside and in the slot. He would be great depth and be someone to keep an eye on as the process continues. CB William Jackson III, Houston. Jackson might be the best senior CB in the draft who has excellent size (6’1, 195) who is an aggressive DB who can use his elite speed as well to play with the best of them. Although it’s still early enough that Jackson will probably be drafted higher in the 2nd and maybe even the bottom part of the 1st if he has a great off season. But, he could fall due to other positions being coveted. He’s someone to keep an eye on. 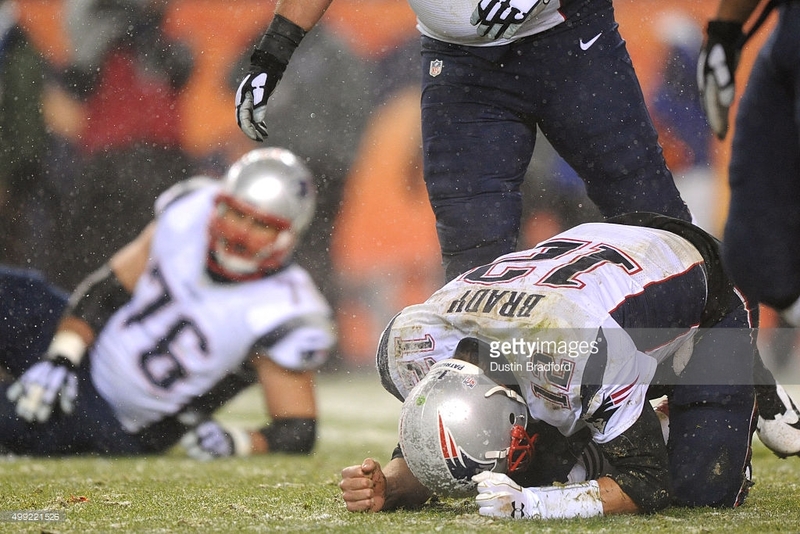 New England Patriots: Is Denver Tom Brady’s Achilles’ Heel? 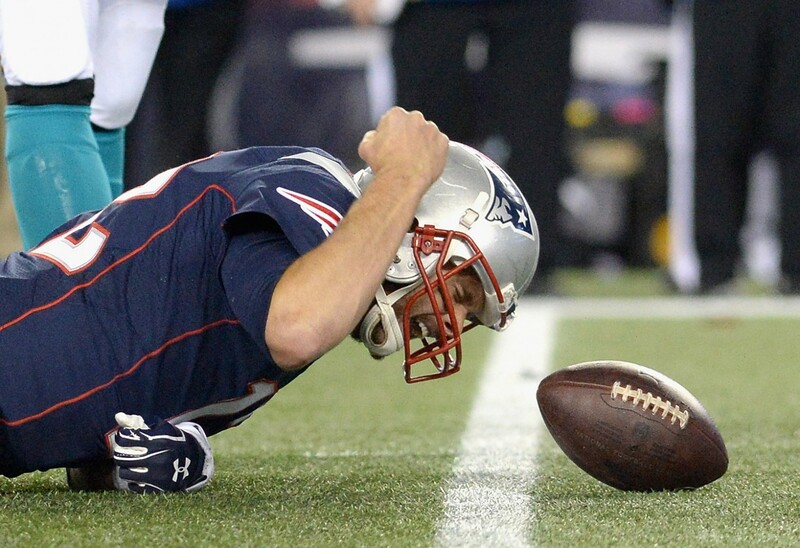 Is it possible the Denver Broncos are Tom Brady’s achilles’ heel? Going into Sunday night’s match-up there was only one team in the NFL TB has a losing record against. It may be hard to believe, but the best QB in NFL history is 6-7 against the Broncos, 5-5 in the regular season and 1-2 in the playoffs. So, here it is. Sunday night at Sports Authority Field at Mile High in Denver and Super Tom still has something to prove…one more mountain to climb. The big difference over past years is ( are you ready for this?) Brady may have a mediocre/poor game and the Patriots still should win. I know, Denver has a great defense…but this year so do the Patriots. The Patriots have allowed the fewest points-per-game (18.2) in the NFL while the Broncos are 18th in scoring (22.2). When you realize how many of the points scored against New England’s defense were in garbage time, after games were already decided, the figure is decidedly lower. Meanwhile, the always tough Denver defense is just behind NE, allowing a measly 18.3 PPG of their own. Yes, the Patriots are 2nd in scoring (32.3), but the days of rolling up points look to be over with a depletion of skill players on offense due to injuries. Danny Amendola and Aaron Dobson will be among the missing (Dobson for the year) leaving Brady with limited options in the passing game. Sure, he still has Rob Gronkowski and Brandon LaFell, but after that there are a bunch of question marks. 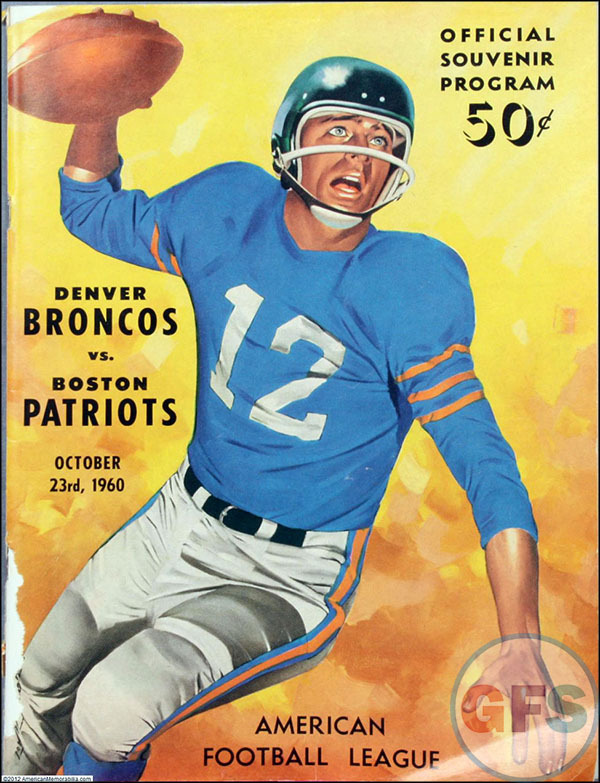 The Patriots are just 9-19 in Denver since the two teams first met in 1960. Ah yes, I remember it well, a 13-10 Denver win. (The long-term memory is fine, it’s the short-term that’s a killer). Here’s a scary stat (courtesy of WEEI’s Chris Price): .842 — Including the postseason, that’s the winning percentage for the Broncos in their last 19 home games against the Patriots (since 1969). Denver is 16-3 in those games. Yeah, I know. Different year, different players…but still, it has to be on Tom Brady’s mind. He absolutely hates to lose with a passion that is unequaled. I know everyone hates to lose, but he takes it to a new level. Just a few weeks back he was pounding the ground in anguish when he was sacked and felt it was his fault…and the Patriots won that game easily! Brady showed his emotion repeatedly in last weeks win against the Bills, and his teammates would rather not face his wrath two weeks in a row. 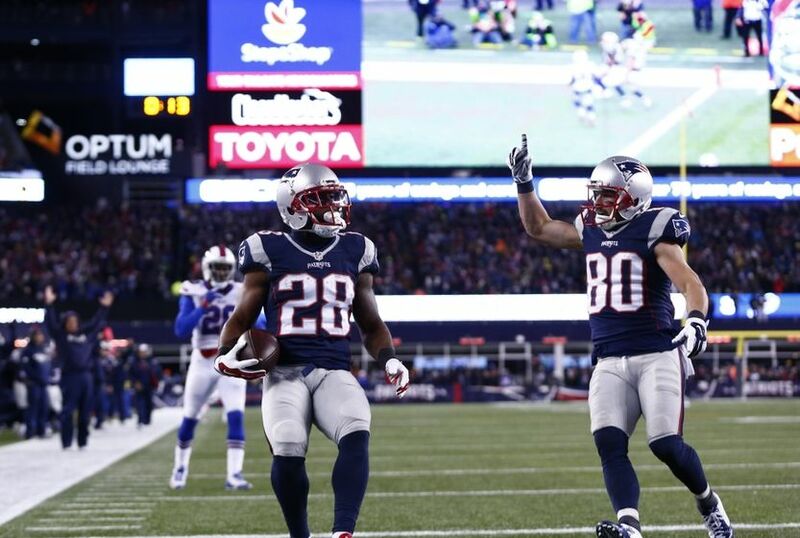 More action from James White, who was clutch despite limited touches, in last week’s win over Buffalo. His snap count should increase with a reduction in touches by LeGarrette Blount. I’m back, and I apologize to everyone who missed reading my weekly picks last week. I was really busy and experiencing some sort of hangover from having my best week, 9-5, the week before. I know all of you guys just muddle through your boring lives until you get the chance to escape them as you read my brilliant picks. Ok, I’m sure you all found a way to fill the void in your lives, and thank you to Joey for filling in for me last week. And for the record, I did still make my own picks and went 5-9, so you’re welcome for not having to read those. Let’s get on to the Thanksgiving special. I don’t know what to make of either of these teams. The Eagles seem like a team that shouldn’t be favored by more than three against anyone, and also shouldn’t be getting more than three points against anyone, while the Lions are a different team every week. However, the Chip Kelly offense could go bananas at any time, and though Bradford’s status is uncertain the running game has been better as of late. I’m taking the points but this is a major stay away. I’m finally ready to start acknowledging the Panthers as legit. I still think the Cardinals are the best team in the NFC, but Carolina has one of the league’s best defenses, a powerful running game, and Cam Newton has absolutely turned a corner. This game is all of a sudden more fun with a healthy Cowboys team, but on a short week I’m going to take the better running game and the better defense in this one. The Bears are a team that isn’t getting a lot of respect. The Packers line is always inflated because everybody loves to bet on them, but while they looked good last week it was the first time they looked good since Week 3. Cutler is having a good season, Forte and Jeffery could both be coming back, and the Bears defense is much improved. I look for the Bears to cover easily, and I think they could pull off the upset. I’m not jumping ship on the Raiders after the last few games. The Titans defense is exactly what they need to get back on track, and their pass rush should give Mariota problems. The Raiders are simply a much better team than the Titans, and they’ve taken care of business against bad teams this year (with the exception of last week). This feels like a classic Andy Reid game to blow. The Chiefs are feeling good, they’ve won four games in a row in impressive fashion and trail the Broncos by three games in the division. This isn’t a must win but it feels like it is, and I fully expect them to be trailing by three with under two minutes to go and all three timeouts, and for Andy Reid to waste all three timeouts on one play where Charcandrick West runs out of bounds on a swing pass that gained three yards, and then Alex Smith tries to throw three more of those passes before they turn it over on downs. The Bucs are a little frisky and Jameis is really coming into his own, but I expect them to come back down to earth a little bit against a Colts team that needs this game more. The Texans have all of a sudden made the AFC South interesting, but Indy got a big win in Atlanta last week, and are undefeated with Matt Hasselbeck starting. They need to win this game and be 6-5 when they possibly get Luck back next week. Seriously Andrew, my fantasy team needs you back, there’s a playoff berth on the line. The Giants are coming off of a bye, and the last time we saw them they all but beat the Patriots again. The Giants are 7-4 coming off of a bye under Tom Coughlin, and had won six straight off of byes until last year. The Redskins had a horrible showing last week, and that defense has major holes. I’ll take Eli and Odell to carve them up. J.J. Watt is once again proving why he’s far and away the best defensive player in football, even if that can only take a team so far. It’s possible that he just swallows a quarterback whole in the upcoming weeks, and Drew Brees is definitely a candidate for that. The Saints defense is putrid, so even a struggling Texans offense should be able to put up points against them, but they’ll obviously win this game on defense. I don’t know what happened to the Falcons, but they’ve fallen off of a cliff. Since their hot offensive start they’ve lost four of five games and the one win was a 10-7 victory over the Titans. Devonta Freeman might not play, and the Vikings need to win. I expect them to bounce back after a bad loss to the Packers. I’m still picking the Bengals to win, but I think the Rams keep it close. They’ve lost three straight but their defense has been good in most of them, and they’re only two games out of a playoff spot. Meanwhile, the Bengals need to clean some stuff up, as they’ve struggled with consistency in their consecutive losses. This might be the best bet of the week. The Jaguars have a real chance to win their division, and the team has a lot of confidence in Blake Bortles. Think about this, Blake Bortles, Allen Hurns, Allen Robinson, Julius Thomas, and T.J. Yeldon are all on fantasy rosters. And frankly, the Chargers aren’t a good team, and they’ll be flying across the country to play a 10 am pacific kickoff. I know the Jets are scuffling, but the Dolphins are simply not a good team. They struggle to ever build momentum because they can’t capitalize off of their own success, and their defense tends to wear down at the end of games. The Jets are in a four-way tie for the last wild card spot and really need all the wins they can get, I think they take care of business at home. I said this earlier, but I think the Cardinals are the best team in the NFC. They have the most balanced offense by far, and probably the best in the league besides the Patriots. Their defense is good situationally and they create a lot of turnovers, and the 49ers are a mess offensively. We all need to stop giving the Seahawks the benefit of the doubt. Let me give you Seattle’s five wins this year: Jimmy Clausen and the Bears, 13-10 over the Lions thanks to a blown call, Matt Cassel’s Cowboys by a point in the last minute, and two wins over the 49ers. The Steelers, meanwhile, are coming off of a bye and are as healthy as they’ve been on offense. This will be the funeral of the legion of boom. Scratch what I said about the Jaguars, this is the best bet of the week. While the Patriots keep losing receivers, they’re getting their line mostly healthy, and they should look more like their offense from earlier in the year than Monday night. Give Rex Ryan credit, he always puts together a defensive gameplan that confuses Brady at the line of scrimmage, and you saw him not knowing who to throw to most of the time. That should change Sunday night, and even without Edelman and possibly Amendola, and the underrated Pats defense should give Brock Ossweiler and his limited running game problems. I’d also like to offer a hot take: Peyton Manning has played his last game as a Bronco, but he’ll try to come back with someone else next year and it’s going to be even more of an embarrassment. Peyton, if you’re reading this, know that you’ve had a wonderful career, you’re a top three and probably top two all-time quarterback. Let it go. You’re tarnishing you’re legacy. Rather than break down the worst Monday night game the World Wide Leader has gotten so far, I wanted to use this time to give my opinion on Johnny Manziel. Like most, I loved watching Manziel in college. I loved how every time I watched him play he did something I had never seen before, and he constantly made a mockery of SEC defenses. And like most, I’ve tried to give him the benefit of the doubt on a lot of his off-field escapades. But he’s done. There’s not a spot in this league for Johnny Manziel. He’s been giving opportunity after opportunity, and he refuses to grow up. In order to be a starting quarterback in the National Football League, you need to act like and adult, and Johnny never has, and from the looks of it never will, because he doesn’t understand. It’s a sad story, because he has all the talent in the world. But I applaud Mike Pettine on the decision he made. For college football fans or just degenerate gamblers who will bet on anything, I’m in a weekly college football pick ’em. Here’s my picks for this week: Alabama (-13.5), Oklahoma (-7), Notre Dame (+2.5), Clemson (-17.5), Florida (+2), Nebraska, Michigan, and Baylor straight up. I, like any good Patriots fan, got a bit irked when they blew the Amendola catch dead with an inadvertent whistle. It most likely cost the Patriots a big play, that may or may not have resulted in a touchdown. But, since we are all in the circle of trust here, we’ve been on the positive side of questionable calls in our day. Sure you can scream to the high heavens that Goodell or ESPN had something to do with it, but Mean Gene is probably the best ref in the business, and he got the call right once it was screwed up. Buffalo beat themselves with poor clock management, undisciplined play, and poor special teams. It is the same old song and dance every week. It won’t be as easy this week, going into Denver with a patch work offense and the only game I’ll pick New England to drop this season. Sorry Patriots fans, it’s a reality. 1)	New England Patriots – Big win against a tough defense, that knocked out two more offensive weapons. 2)	Carolina Panthers – Cam Newton will challenge TB12 for the MVP. 3)	Arizona Cardinals – I still think Arizona trips up in the playoffs against either GB or Seattle. 4)	Cincinnati Bengals – The Red Rifle is softer than dog poo. 5)	Denver Broncos – When we were all expecting Brady vs. Manning XVII, we are getting Brady vs. Osweiler One. 6)	Green Bay Packers – Green Bay is back to being Green Bay again. 7)	Minnesota Vikings – Minnesota has a way of making things easier on their opponents in crunch time. 8)	Seattle Seahawks – Nobody will want to play Seattle come January, just based on the mystique. 9)	Pittsburgh Steelers – Coming off a bye week. 10)	New Jersey Giants – Coming off a bye week. 11)	Kansas City Chiefs – Watch out, the Chiefs are making a run. 12)	Indianapolis Colts– Chuck Pagano’s team believes in him. I’m not sure how to take that statement. 13)	Atlanta Falcons – That is the sound of the Falcons going down the toilet. 14)	Oakland Raiders – Amari Cooper had four yards receiving. You may not see that again…. Ever. 15)	Houston Texans – JJ Watt is slowly climbing the ranks of biggest DB’s in football. I’m not talking about defensive backs either. 16)	New Jersey Jets – The Jets started out so promising and have come back down to reality, and quickly. 17)	Buffalo Bills – Undisciplined football and bad clock management continue to be the bane of Rex Ryan’s existence. 18)	Miami Dolphins – Well, you let Dallas have a glimmer of hope. 19)	Philadelphia Eagles – Chip Kelly should go back to coaching the other birds up in Oregon. 20)	St. Louis Rams – Case Keenum looked like Rocky dragging himself off the canvas in his second title fight with Apollo. 21)	Dallas Cowboys – I see a small, tiny sliver of hope in Dallas. However, that may go dark when Carolina comes to town on Thanksgiving. 22)	Tampa Bay Buccaneers – Tampa Bay has double the amount of wins they had all of last year. 23)	New Orleans Saints – Coming off a bye week. 24)	Chicago Bears – John Fox gifted a win to his previous team on Sunday. You had one job John, one! 25)	Jacksonville Jaguars – Can Jacksonville make a late season run at the listless Colts? I highly doubt it. 26)	Detroit Lions – Three in a row for the Martha Ford Lions! 27)	Baltimore Ravens – Joe Flacco got hurt, so did Justin Forsett, but that doesn’t matter when you only have three wins. 28)	Washington Redskins – Washington proved once again why they will never be contenders in the NFC East. 29)	San Francisco 49ers – The Niners gave a valiant effort on the road in Seattle, but that isn’t enough to win football games. 30)	Tennessee Titans – Tennessee needs to address the defensive line and running game in the offseason. 31)	San Diego Chargers– San Diego can’t get to LA fast enough. 32)	Cleveland Browns – Coming off a bye week.